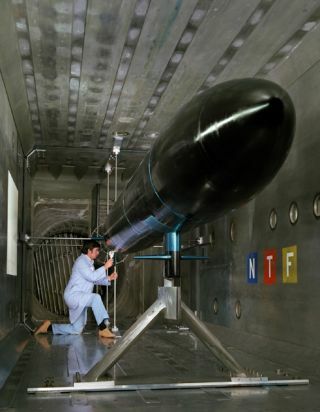 A submarine is shown being tested in one of NASA's wind tunnels. In this historical photo from the U.S. space agency, a navy submarine is shown undergoing tests in the National Transonic Facility on Oct. 3, 1986. Because air works in the same way as a liquid, it can be used to simulate the effects of water on a submarine hull.